After not being able to post a new blog with pictures, suddenly through the night an idea slipped into my mind. Asian adventure.... First stop Malaysia . After a tumultuous few weeks,and with mixed feelings Nick and I are off to experience new adventures. First stop Melbourne. Thanks Roman for your hospitality and the viewing of your new kitchen. Well done. 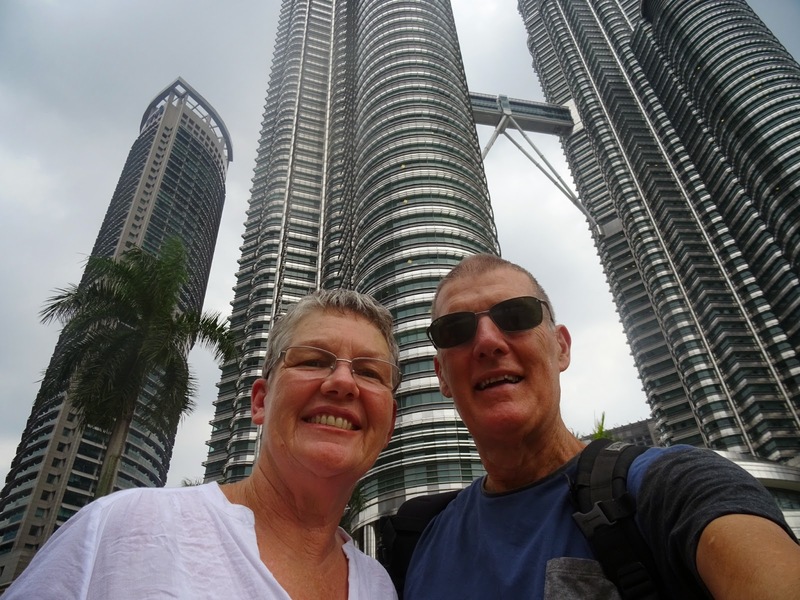 23rd February saw us on a Air Asia flight to Kuala Lumpur. I must admit of all the times we have flown, this time I was a tad nervous with the disappearance, shooting down and crashing of planes over the last year or so. Air Asia is a brilliant low budget airline, I must say. When we left Adelaide it was 45 deg and extremely humid. 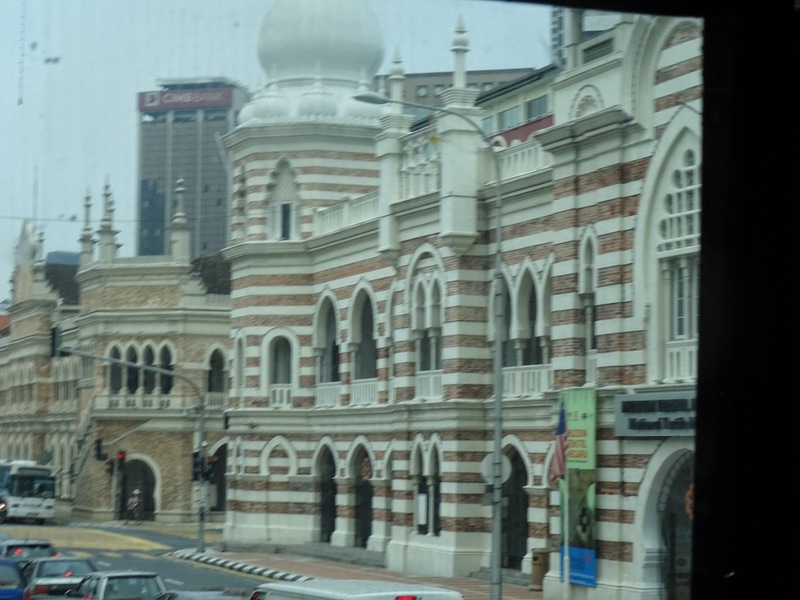 When we arrived in KL it was much nicer. Nick booked us into a brand new hotel. What a treat for us. The pool was wonderful after the long days of sightseeing and walking everywhere. Once again we took the hop on hop off bus around the city. Great value. Great food at the night markets. Nick's birthday saw us visit the Petronas Twin Towers. They were spectacular even if they were built by an oil company. Fabulous night out celebrating his 65 th with mojitos and a great dinner. We looked at the map and decided to travel to the west coast. Our plan was to camp at Tullah as the man at the information centre in Burnie said it was a very pretty place. We visited, but every thing was closed and as we still unable to free camp we continued on to Rosebery. It was getting late in the day and we thought it would be worth staying as we could travel north to Cradle Mountain and also south to Strahan. We were getting much better at putting up the van and in no time we were settled for the night. An early start next morning saw us heading off to Cradle Mountain. A winding road and lots of road kill later, not our kill, we arrived at the National Park. On the ferry to Devonport we bought a Park pass for $60 which gives a car load of up to 8 people unlimited access to the parks for a couple of months. It also meant we could have a free bus ride within the park and walk to where we wanted. We decided to take the walk around Dove Lake. A great walk and in just under 2 hours we completed the 6.4 km circuit. We enjoyed a coffee at the ranger's station and started dressed warmly, but by the time we had finished it was down to t-shirts. We picked up a booklet 60 Great Short Walks Tasmania. The weather was not looking the best so we decided to pick a walk close by. The national park was only half an hour from Devonport. On the way we stopped at Port Sorrell. A very pretty place and if we had more time we would like to have stayed longer. It looks like during the summer the place would be full of holiday makers. There are plenty of caravan and camping sites, the beaches look great and there are many places close to visit. By the time we were half way through our walk it started to rain, but we continued on. The walk along Baker's beach was great but wet. And Today we decided to travel to Stanley and climb the Nut. On the way we stopped at the markets at Burnie. Another great market with lots of local produce. Local pickled onions and some other products like cheese, vegetables, jams and walnuts were available as well. Onwards to the information centre and discovered a very enjoyable way to spend some time. Every day there are local artists and craftsmen displaying their skills. Burnie used to be a major paper producer, but finally closed in 2010 and left a large hole in the local economy. Tourists can now make their own paper. The paper makers obtain their raw material from many sources. You can make paper from timber, cotton, hemp, denim or many other materials. We watched a deckle maker. They also have spinners, weavers, screen printers and many other craftsmen. A great place to spend a few hours. We arrived at Stanley and started the climb. The Nut is 152 metres high and took about 20 mins to climb to the top followed by about an hour to complete the circuit. We did weaken and catch the chair lift as we were unsure if Gabrielle's knee would hold up for the steep descent. After visiting Cheese factory and finally a chocolate factory we picked up the car with a new radiator. We arrived back at the van and noticed wetness where there wasn't supposed to be any. We found the entry point of the water and dried everything. Next morning a visit to the hardware store for some sealant and then after the leaks were fixed we headed to Ulverstone. There was a very helpful staff at the Information centre and soon we headed off to the Leven valley. Still in the rain, we next visited a salmon and ginseng farm. We woke to the sound of rain. Luckily we had booked a tour with Australian wild harvest. We organised to be picked up from the mechanic's as we had been leaving a pool of green coolant every time we stopped the car. First stop was Cradle Coast Olives. We discussed our olive pick and the owner Tony O'Neil was very informative in providing information as to improving the oil production of our crop. Next stop, a saffron farm. Very interesting. It continued raining as we went to a berry farm, growing strawberries, raspberries and others. The stamens of the flowers are removed and dried. The ferry arrived at Devonport at 6am. It was about an hour before we were on our way as we had to pass through quarantine to make sure no diseases or pests arrive on Tasmania. First thought was breakfast and coffee. Petrol was a bit low, so a visit to a fuel station was required. Note to self, next time fill up on the mainland. Diesel is $1.68 a litre here. The service attendant suggested Bella's for breakfast. It was open and we had breakfast and that much needed coffee. Reading the local paper and we saw that there was a market at nearby Latrobe, so off we headed. We stocked up on local fresh produce. We also saw that there was a mural display at Sheffield and thought it would be worth a look so off we headed. On the way we drove through Railton. The home of topiary.